I’ve already shown a few of the cards I got from good friend of the blog Hiflew from Cards from the Quarry. You can find those sprinkled throughout my All-Star Team post, back when I had a brief bout of timeliness. To avoid this being insanely long, I won’t show everything in the generous package, but here’s a nice smattering to enjoy. 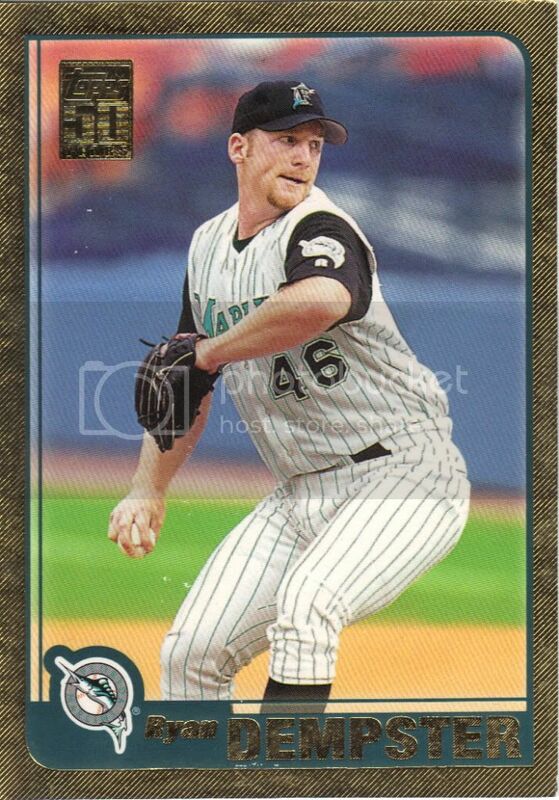 I can’t completely remember what initiated the trade in the first place, but I do remember this particular card was an add-on late in the game. 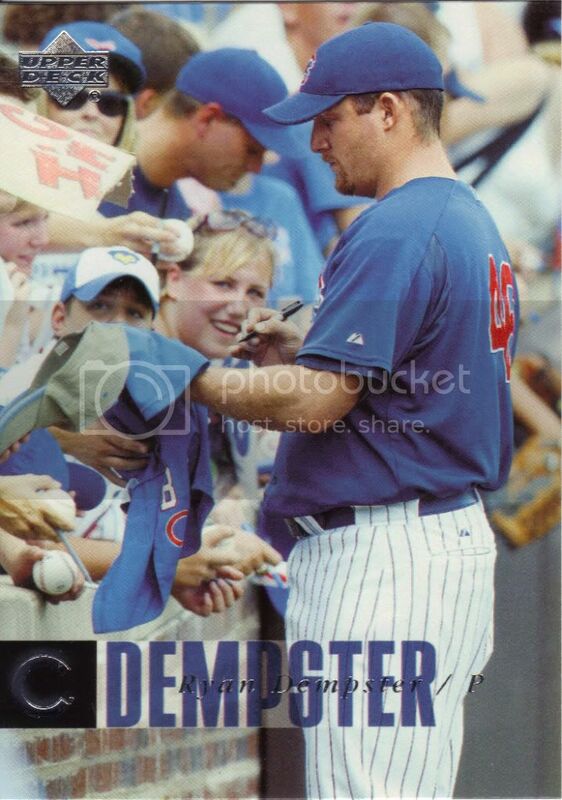 I had just started my Kerry Wood collecting, if that gives you an idea of how long ago this was. Well, hiflew pulled this baby out of a blaster and it had to be mine. Oh yes. It will be mine. If you’re wondering why he looks so mean, it’s only because he’s not in a Cubs uniform. It’d take a couple years to get him back in one. If you thought Topps parallels were nuts-o bananas, well, you would be right. You would also be right if you said 2006 UD was equally that. I’m talking more about the F/X crap. I have the red version of that, and now I have the crisp, clean, un-foiled regular, why bother if there’s no color base card from the normal Upper Deck set. Have I mentioned that I really don’t like parallels? Oh, but I still collect them. 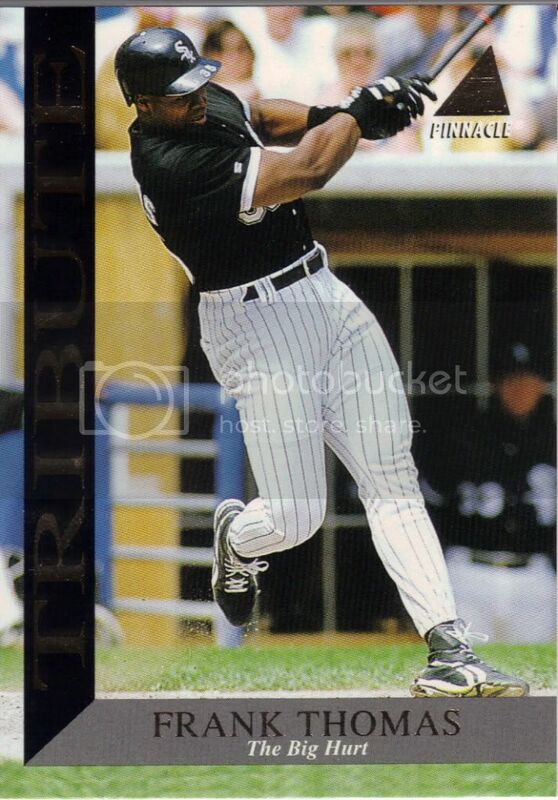 If I had my way, this would be perfectly acceptable as the only non-insert 2006 UD flagship card I need. 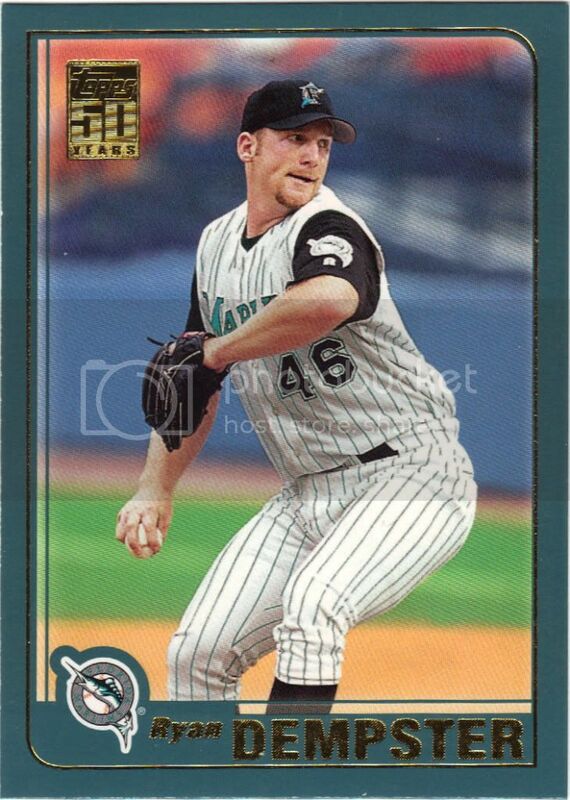 Technically, I’m not collecting non-Cubs Ryan Dempster cards. They’re not part of my want lists at this moment. I’ve tinkered with the idea of just saying what the hey and adding the suckers, but then I think about all the other cards I still have to chase of the other five guys I collect and that part wins out. Still, if people want to send Marlins or Reds cards as “bonus” items, I’ll gladly accept and add them to the front of my chronologically organized binder. I just won’t actively trade for them. The foil stamp on the back is big and gaudy and beautiful. The foil on the front can be described this way too. Hell, you gotta go big for the big 5-0 anniversary, right? No gold teeth or Mr. T gimmick cards to be found, unfortunately. 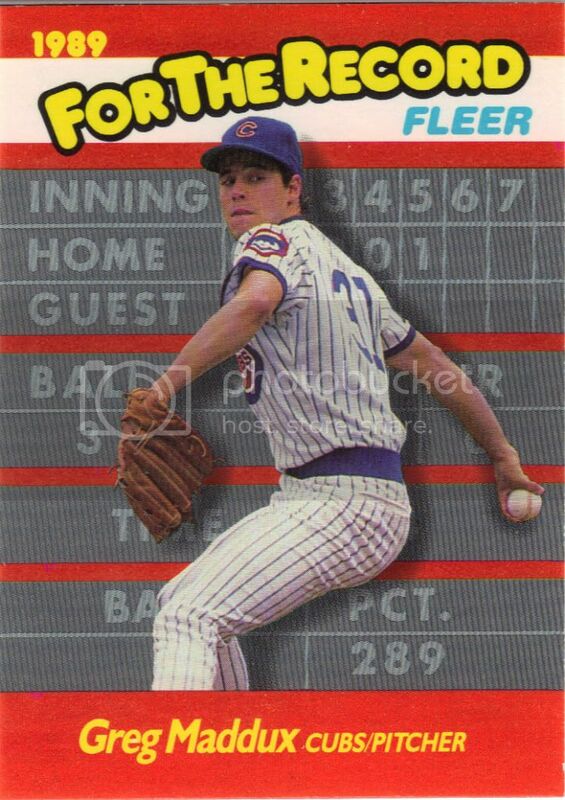 This card screams ’80s to me. I’m pretty sure it’s the bubble font up there. Now, based on the title of the insert, you would expect talk of a record being set. Nope. Just a densely packed block of text talking about his break0ut year in 1988. I do love the front, though. It’s like a gray version of Wrigley, except weird and kind of stupid. I’m trying to think of a celebrity analogy here. Help me out. What the hell is going on in that background? What a contrast in pictures. Young Greg looks nothing like old Greg. That crazy backdrop makes me want to play Crystal Castles (the Atari game, not the band). Wouldn’t that card be better with a bear wearing a magician’s hat jumping in the background? I think so. I also think that I may need more sleep than I previously thought. I’m marking this as the Red Back version. Nothing on my checklist indicates mini versus regular and so that’s the best I could figure. 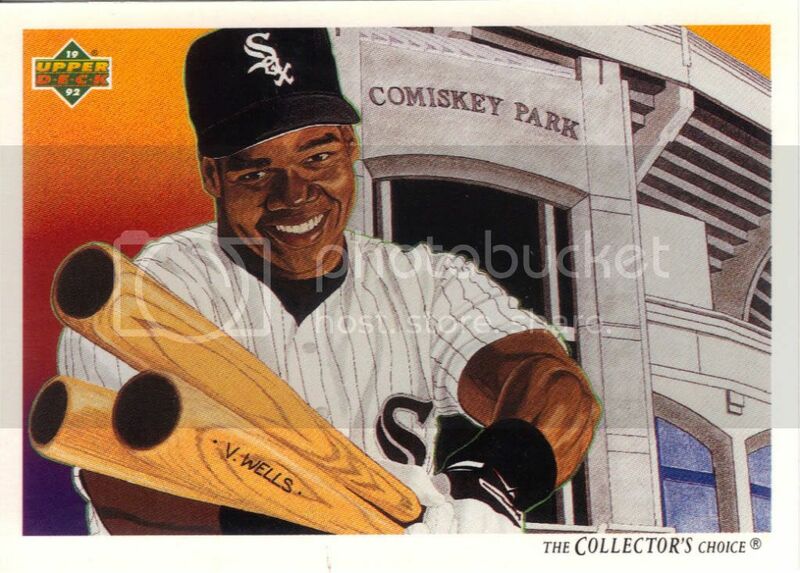 Please let me know if I’m wrong in thinking mini=Red Back for 2007 Goudey. 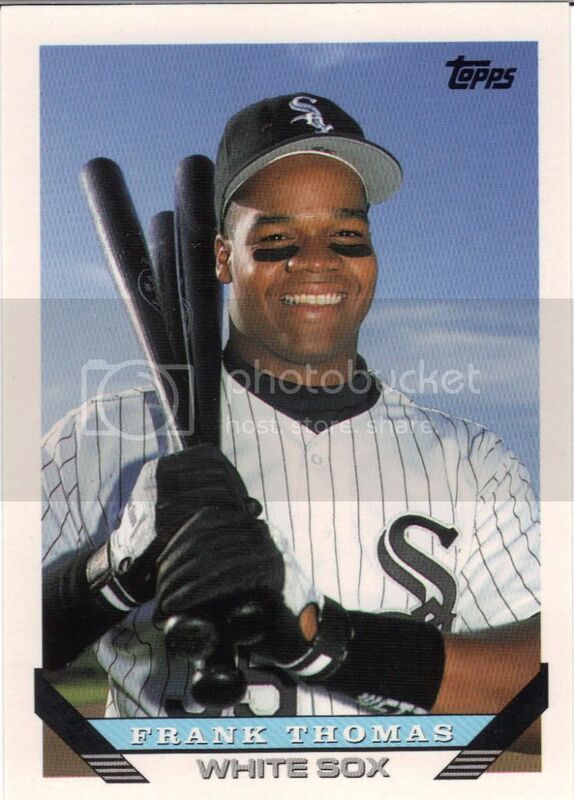 Frank Thomas is smiling because he stole Vernon Wells’ bat and replaced it with Folgers crystals. Let’s see if he notices. That reference would make sense in 1992 in one respect and not so much in the other. The back doesn’t tell me V. Wells’ full name, but it’s safe to say he’s the artist. I absolutely loved these team checklist cards. Getting an art checklist card was just as good as getting an insert where I come from. I never understood why they were less valuable, when they looked so much cooler. What's with the 3 bats? Two cards, 6 bats. I smell a youtube sensation! A few of these Thomas cards fall under the “probably in a 5000 ct box in the basement back home” category. I know I ain’t got time to drive out there and check, so I’m content getting “extras” if that’s what it turns out to be. I can be fairly certain that I don’t have the gold or promo versions, however, so please let me know if you do. This is just a tribute. You gotta believe me. And I wish you were there. Just a matter of opinion. Oh, how I miss early ’90s Pinnacle. These inserts look like they took no effort, yet come off as awesome. I don’t know. Maybe it’s the use of foil on the front and back, when that kind of thing was still a big effin’ deal. You really felt like you got something special. Classy stuff, unlike later Pinnacle efforts where they threw glitter on vomit and then tacked a picture on top. This is not that. No glitter vomit here. I had no idea this card existed. I think that’s saying something for a 1993 issue, don’t you? What’s more interesting is the lack of number on the back. What these two love birds share is more than just a song. They also share the achievement of compiling 100+ RBIs in their first two years. The back calls Thomas a black belt Samurai Swordsman. I might adopt that nickname, even though I don’t think Samurai’s go by the belt system. It should have caught on. 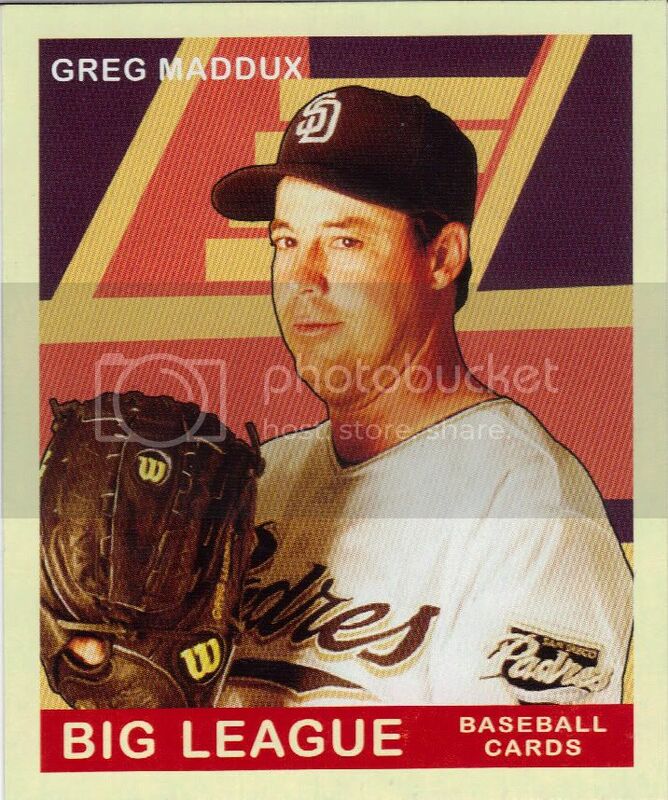 But it didn’t, because no one knew this card existed. No one. Don’t debate me on this. Hiflew didn’t even know. It just found it’s way into the package. 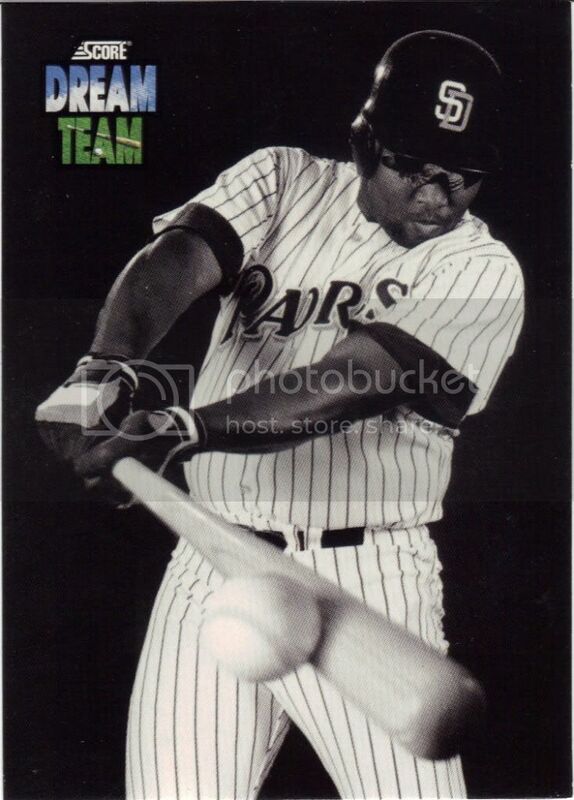 Is there anyone that didn’t love the Dream Team cards? I mean aside from the oiled-up, naked Rickey Henderson. Why aren’t cards creative like this anymore? It doesn’t take much. A studio setting, a black & white photograph, good depth of field and lighting. Simple elegance for a simple, elegant game. Now it’s all colored border parallels of the same damn image. Let’s see some freakin’ subsets people! If this were a film set, I would have yelled "striking" before displaying this card. I just wanted to wake your eyes up. Tony tries to see the umpire waving his hand in front of him, but Tony can’t see. All Tony can see is radioactive yellow. Tony may be blind. 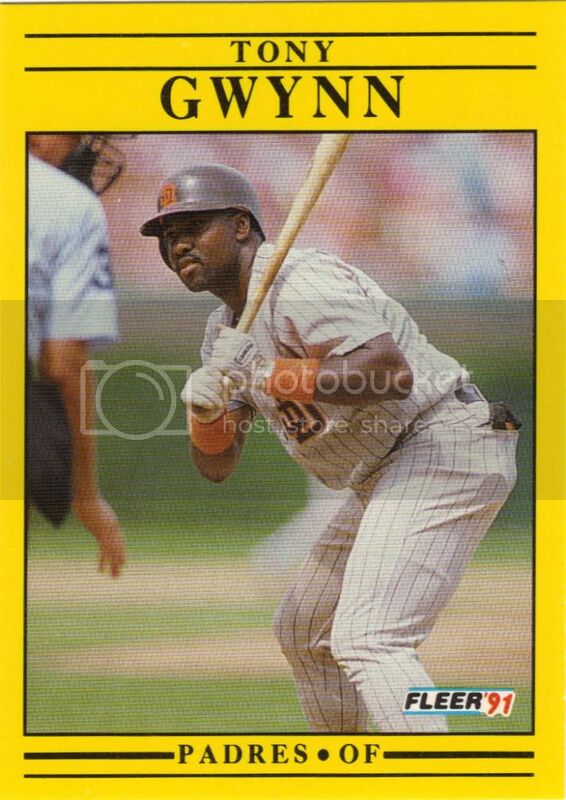 The last card I’m going to show is also the oldest in my Gwynn collection. Thanks to this trade I got the 1985 All-Star card I showed before and this 1984 dandy. Any card pre-dating 1986 when I got my start seems ancient and foreign to me. I absolutely love getting cards like this in the mail. 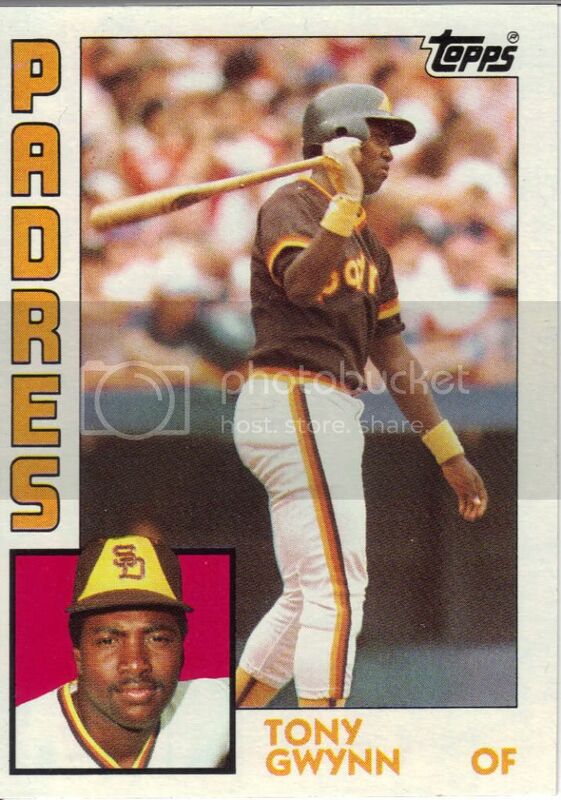 Every time I open the Gwynn binder, this card will be right there looking back at me to remind me of the awesomeness of bloggers and trading and older cards and crazy brown uniforms. Thanks very much again to hiflew. Dude is a great trader and box breaker. How have you not dumped all your Rockies cards on him yet? Go! Glad you enjoyed the cards Jon and thanx for the plug. BTW, this trade was for that CarGo sparkle card you pulled. I get mixed up with what went where too, but that card is pretty memorable. 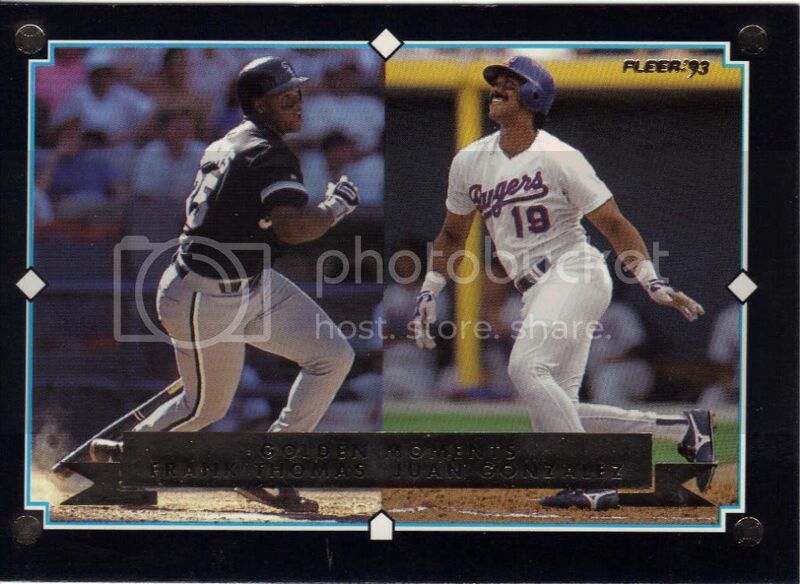 Also, why did you have to bring up the naked Rickey Henderson card. That card haunted me, I think I pulled 10 copies of it way back when. Thank you! I was thinking about going through emails to see what it was, but I decided to put my head down and write instead. I’m sure I have more to trade, so we’ll have to do it again sometime soon here.